Wednesday, May 23, 2018 — Today, Reverb.com—the leading online marketplace dedicated to buying and selling music gear—unveiled its new 10,000 square foot office expansion. 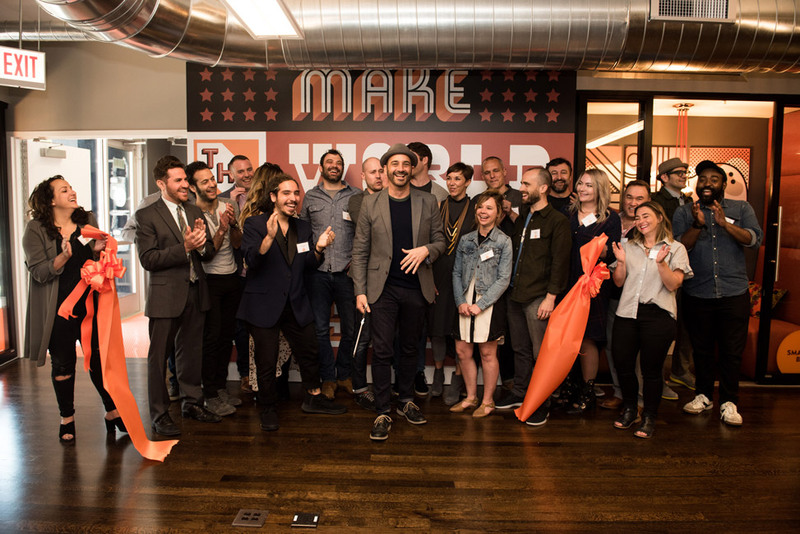 The new space, which more than doubles the size of the company’s Roscoe Village headquarters, will accommodate the music marketplace’s continued growth. This year, Reverb estimates it will increase headcount by 50 percent and close the year with approximately $600 million in sales. Over the past year, Reverb has hosted music gear sales for artists ranging from the Smashing Pumpkins’ Billy Corgan to Green Day’s Billie Joe Armstrong, and nearly every week, the company hosts local and international artists at its office for video interviews, demos, and more. To support the company’s continued focus on high-quality video content, the new office addition will feature a sound-balanced and acoustically-engineered video production studio, complete with control center and green room. The room features acoustic treatments made of reclaimed wood and faux brick, inspired by Chicago's vibrant, underground music scene. The large “Make the World More Musical” mural that greets you upon entering the building. The pop-art instrument-inspired vinyl decals on the road-facing windows. The large, vibrant, music-inspired murals featured throughout the meeting rooms. Nearly 50 unique pieces of canvas art celebrating artists ranging from Tom Petty and the Beach Boys to Björk and Beyonce. While the Reverb marketplace features new and used instruments of every shape and size, the company initially made a name for itself as a platform for used and vintage music gear. With the company’s roots and sustainability top of mind, lead designer and All Things Esque Owner Catherine Nordloh was dedicated to building out the space using almost exclusively reclaimed wood and furniture made by local artisans. In total, the buildout supported more than a dozen local and/or small businesses—a decision that Nordloh made to mirror Reverb’s dedication to the small music gear shops it supports on the platform. To learn more about Reverb.com, visit ww.reverb.com. Reverb.com is the online marketplace to buy and sell new, used, and vintage music gear. Since launching in 2013, Reverb has grown into the most popular music gear website in the world, with sales reaching nearly $400 million in 2017 and more than 10 million musicians and music lovers around the world visiting the website each month. In 2017, Reverb was ranked No. 18 on the Inc. 5000 list of America’s fastest-growing private companies. The same year, the company launched Reverb LP, an online marketplace for buying and selling records and other physical music.